Critical thinking is the necessary ability to exceed common patterns of thinking and reflect upon problems from different perspectives using both analysis and synthesis. Thinking “outside the box” is the oft-suggested simplification of this process, and often the first step towards doing so is to acknowledge, as much as possible, the prejudices of the mind that bias our judgment. In what follows, I offer two critiques for your consideration. My first critique is of a parochial, yet casually accepted, source of supposed critical thinking being taught as the sole example for future military leaders in a professional military education course. In thinking critically, if one needlessly limits themselves to a single point of view, as you’ll see, you’re setting the wrong example by design and begging for trouble. And second, and much more importantly, I critique the more insidious lessons provided by the sole source of critical thinking within a specific case method. To wit, the err of a strategy is much more important than any err of planning. True critical thinking, and not some chimera of such, aids the professional military member in both the endeavor of mitigating bias confirmation and confusion in the relationship between strategy and planning processes. 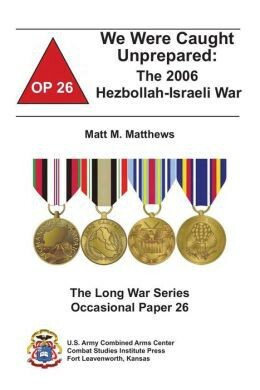 Matt Matthews’ We Were Caught Unprepared: The 2006 Hezbollah-Israeli War is a product of the U.S. Army’s Combat Studies Institute (CSI) documentation of the lessons learned from the 2006 conflict in southern Lebanon. This book, which is really an occasional paper, is used in a critical thinking course for the U.S. Army’s staff officers and future leaders at its Command and General Staff College (CGSC) as a case study for exploration in which the student will learn to “question where and how you get the information upon which you base your decisions.” Currently, another course is beginning at CGSC, with another round of students taking on their studies, including this foundational course in critical thinking. While the Second Lebanon War in 2006 is certainly a great case for method analysis, I’m not sure the U.S. Army is teaching its “Iron Majors” in this specific course the correct lessons in critical thinking. The takeaway here is that using this text alone without additional caveat or even contrast is apt to leave the over 1,000 officers who read it annually with an informal fallacy of causation for the IDF’s struggles in Southern Lebanon during its 2006 campaign. Really, what the course is achieving is a veiled reinforcement of selection bias and calling it critical thinking. The use of this extremely problematical yet popular text is really about disputing effects-based operations (EBO) and the usefulness of airpower, and not about critical thinking. Ultimately, just like Matthews does in his text, the course fails to use critical thinking in the analysis of the case study in an over-eager attempt to discredit EBO and airpower. This problem is important because the lesson is foundational to the CGSC experience, which counts towards Joint Professional Military Education, and is the stage-setting course for what is likely the final episode of formal education that most of the U.S. Army’s officers will receive for the rest of their career. By and large, the CGSC education is top-notch, but critical thinking is so foundational, so important, that this specific course must not suffer from a self-defeating failure in its selection of text for use in the 2006 South Lebanon case study. What I am not saying here is that Matthews’ assessment is wildly off in its critique of some selected particulars of EBO and airpower, which would only be an echo of the eloquent arguments that Lieutenant General Paul Van Riper (Retired, USMC) has made, or to a much lesser extent Dr. Milan Vego. What I am definitely saying here is Matthews widely missed the mark on the root cause of the Israeli Defense Force’s (IDF) problems in 2006. Furthermore, if not carefully managed in curriculum design, Matthews’ occasional paper will leave its readers with the conclusion that “for want of a nail…the kingdom was lost.” Which is a symbolic narrative where a king could not escape his rebellious peasants because the horse threw a shoe, and is only true as long as you ignore the policy precursors that precipitated the rebellion. With this metaphor in mind, as you will see below, CGSC should consider another source or text as either a replacement or augmentation to Matthews’ work so as to make the analysis via the case method more productive in terms of generating student critical thinking. One possible alternative to Matthews’ flawed work might be William F. Owen’s article from The British Army Review Journal titled, “Back to Basics: What the British Army Should Learn from the 2nd Lebanon War.” Another possibility for consideration is Dr. Stephen Biddle and Jeffrey Friedman’s Strategic Studies Institute (SSI) monograph titled “The 2006 Lebanon Campaign and the Future of Warfare.” Like Matthews’ CSI publisher, SSI is also sponsored by the U.S. Army, but was able to successfully steer clear of over-elevating concepts and operational art over strategic mistakes and political choices as lessons learned. Finally, and probably most appropriately, CGSC might consider “Hard Fighting: Israel in Lebanon and Gaza” by David E. Johnson. Johnson’s work is clear-eyed about the limits of all differing capabilities against a “hybrid threat,” and while he spares no critique ofSystemic Operational Design and the hubristic Brigadier General (Reserve) Naveh, he maintains the correct order of things in highlighting the political and strategic conditions that hastened the hard fight. Let us turn now, then, to a deeper examination of the U.S. Army CGSC’s chosen example of critical thinking as embodied in Matthews’ work. No conflict in recent past provides a more illuminating study for the US Army than the 2006 Hezbollah-Israeli war. After years of conducting successful counterinsurgency operations against the Palestinians, the Israeli military encountered substantial problems in shifting focus to major combat operations against Hezbollah…. Implications for the U.S. Army in this area should prove enlightening. [Matthews’] research convincingly argues that the Israeli reliance on poorly understood and controversial Effects-Based Operations (EBO) and Systemic Operational Design (SOD) warfighting theories, and a nearly singular dependence on air power, were root causes of Israeli problems. Placing Matthews’ possible airpower schadenfreude aside, the message is clear: don’t worry about not having a coherent military strategy, if you discard the EBO planning concept then you have grasped the salient lesson of Israel’s Second Lebanon War! Surprisingly, even despite all of this, Matthews’ work still retains the honor of being the first and only case-method reading assigned for the U.S. Army’s Command and General Staff College lesson dedicated to thinking critically! But lets extend the argument further by analyzing the cost of this, shall we? In a related failure of critical thinking, or at least in gathering further analysis and evidence to preclude selection bias, General James Mattis’ oft-quoted USJFCOM Commander’s Guidance for Effects-Based Operations cites Matthews’ work quite heavily as a clear case as to why EBO is cause for concern in future U.S. joint operations. In his reliance upon Matthews, it then becomes quite ironic that Mattis suggests that using EBO is astrategic. The lackluster performance of the IDF in the 2006 Hezbollah-Israeli war was the result of a multiplicity of factors…. [the Chief of the IDF General Staff’s] steadfast confidence in air power, coupled with his disdain for land warfare, increased the strength of the IAF at the expense of the ground forces. Henriksen also highlights significant shortfalls in Matthews’ research. Despite “comprehensive examination,” Matthews missed significant points from another significant report by Avi Kober titled The Israel Defense Forces in the Second Lebanon War: Why the Poor Performance? Kober’s report, amongst other things, highlights the Israeli Air Force’s (IAF) pre-conflict admission of limited capacity to hunt down and destroy Hezbollah’s katyusha rocket batteries, which places Matthews’ insinuation of “steadfast confidence in airpower” upon shaky ground. Most significantly, Kober’s report also highlights the significant strategic shortfalls of the Israeli political leadership in the 2006 conflict. This absence of strategic context is the crux of Henriksen’s critique of both Matthews and subsequently Mattis, and should be evident to CGSC students if provided more context or alternative sources for this case. Debating EBO without acknowledging the more general challenges of strategic thinking the wars portrayed by General Mattis and others as empirical evidence of the flaws of that concept is somewhat intellectually dishonest and analytically misguided. Mattis’ guidance saw fit to make EBO verboten in joint doctrine. But EBO in some form is still alive and well throughout the United States military combatant commands. This is especially true in the intelligence, targeting (not just of “closed systems”), and future plans areas of the combatant commands. Ironically, Mattis’ own Central Command, as recently as his departure as its Commanding General in March of 2013, was extremely enamored with the processes of EBO, specifically “effects-based targeting,” and prudently would not finalize operational planning decisions without significant “modeling” and astrategic “predictive analysis” that he panned in his now famous memorandum. The key, and critical, difference was that General Mattis was certain to provide guidance in addition to utilizing EBO practices, and certainly did not use these tools as a replacement for his well informed intuition. This is a difference in the details of application which would be completely lost upon Matthews as demonstrated in We Were Caught Unprepared. Nevermind context. Nevermind strategy. Nevermind thinking critically. Finally, the implications of this specific lack of critical thinking could be much broader than an innocent curriculum oversight. What if Matthews’ lesson is being applied in other ways it should not? If Mattis made the mistake, why couldn’t others as well? And if that is presumed possible, then it is no wonder that the “Easy War” meme perhaps comes too easily for some.